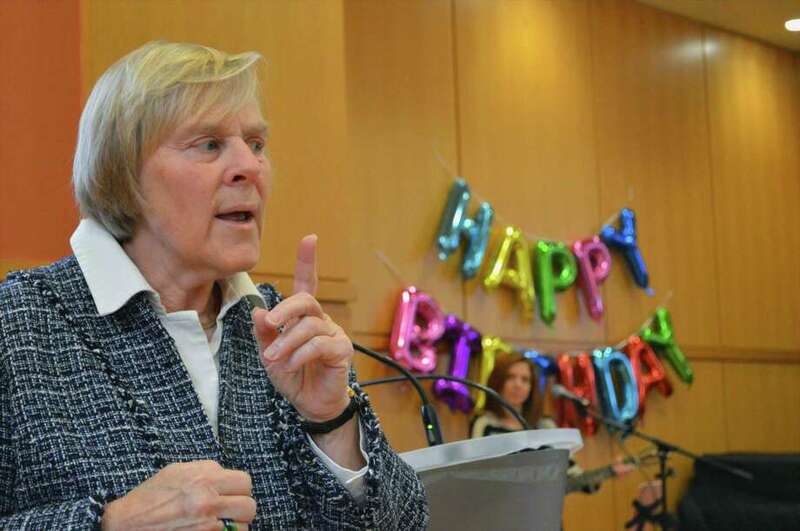 Sue McGraw of Darien shares about the legacy of her late father at the 10th birthday celebration of the Darien Library, also in honor of Harold W. McGraw, on Saturday, Jan. 12, 2019, in Darien, Conn.
DARIEN — While the late Harold W. McGraw would have turned 100 this week, one of his greatest legacies — Darien Library — conjointly celebrated its 10th birthday in his honor. Saturday saw the trappings of a party at the library in recognition of its decadelong resettlement at its current location, and the generous donor who helped make it happen in 2009. His daughter, Sue McGraw, shared some thoughts with partygoers, who enjoyed face painting, food, crafts, and a music show. “Love is something that, if you give it away, you end up having more,” she said, noting how the staff in particular help bring the magic of the library to the community. “She has continued her father’s legacy, which is special,” said Samantha Cardone, children’s program coordinator.